5000K viewers, high luminous intensity, ultraflat, homogeneously lighted on all their surface thanks to the particular conformation of the internal lamp. They are easy to carry because, besides being very compact and light, they are fed at 12V or 24V and the models SLIM 4X5" and 7"X5" can be fed also with six 1,5 V AAA batteries. With the SLIM viewers, it is possible to see all the transparent and translucent objects at "solar temperature" 5000K, for this reason they are particularly appreciated in the photographic sector. They can be provided with or without a stabilized power supplier. 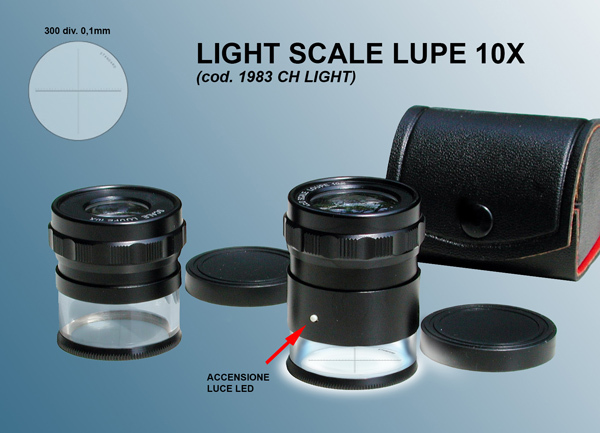 Peak Scale Lupe 10X includes achromatic accurated lenses (4 elements in 2 groups), a measuring scale and a ring nut for focusing. Its magnification power is 10X. The contradiction between the high resolution power and the wide visual field has been completely deleted from this product, offering the possibility of efficient measurements. It has got a practical carrying case too. The Steinheil type lens is composed by a dual-convex lens with strong curvatures made of crown glass and two negative "meniscus lenses" of "flint glass" cemented together. A lens of this kind is often used also as a handable mono-ocular lens, thanks to its support, its excellent chromatic correction and its reasonably wide field of view. The new Peak Steinheil Lupe series, consisting of mono-ocular lens with a magnifying power respectively of 7X, 10X, 14X and 20X , have been designed also to put the in the pocket. The cemented lens block is mounted on a light weight cylinder made of black plastics, and a sliding frame of the same material covers and protects both lens surfaces from dust and mechanical damages. In the working condition, the frame is slidden to form a convenient handle for mounting the loupe. The new series of loupes is very useful for fans of gemmology. A completely new model has been added to the line of popular, high quality Peak magnifiers. The Peak Magnet Magnifier is a unique magnifying glass that has broken away from conventional models. Two small sized magnets have been attached on both sides at the bottom part of the transparent resin lens barrel. The special feature of this magnifying glass is that it can be easily and conveniently attached on micrometers, machine tools and other measuring instruments made of steel, for an increased readability and accuracy. Due to the adhesion quality of the magnets, the magnifier will stay attached to the measuring instrument regardless of its position, that is whether the measuring instrument is used in an upright or slanted position. Furthermore, the Peak Magnet Magnifier can be conveniently used on steel desks or steel panels as a combination paper holder and magnifying glass.